Meteorite wedding bands and engagement rings. Men’s and women’s meteorite ring. Meteorite ring is a unique piece of jewelry. If you're looking for a ring that's seriously out of this world, you'll love the meteorite ring options from our exclusive collection. Every meteorite ring in our assortment features a precious inlay made from a slice of the four-billion-year-old Gibeon meteorite that crashed into the Earth thousands of years ago. Extraterrestrial and extraordinary, each of these meteorite rings is 100% unique with its own series of cross-hatches called Widmanstatten patterns. It's the perfect gift for the jewelry-lover who rocks. It took billions of years for the Gibeon meteorite to find its way to Earth, and the journey is visible in every meteorite wedding band. Although the meteorite is old (the ultimate antique, if you will), it's also strong and long-lasting. After all, it survived in space for over four billion years. The exceptional strength of the material extracted from the Gibeon meteorite is due to its composition of nickel and iron. Your meteorite wedding ring isn't just about durability, however. Style plays an important role, and you'll quickly discover that our designs range from the sleek and simple to those with more ornate accents. 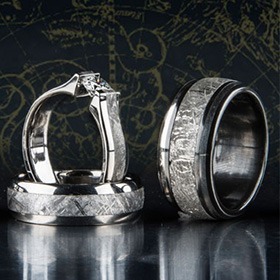 Every meteorite wedding band features attractive materials such as titanium, black zirconium, and 18-karat gold, which in every case add to the unique appearance of our designs. 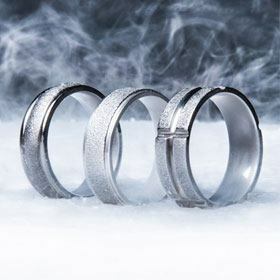 Because the meteorite portions of these meteorite wedding bands contain a composite of nickel and iron, some of these items might not be appropriate for those with base metal allergies. However, these same materials do make your meteorite ring resistant to rust, when worn regularly, due to oils in the skin that coat the iron and keep it from oxidizing. We've made each meteorite engagement ring for men and women even more unique by including complementing materials in every design. 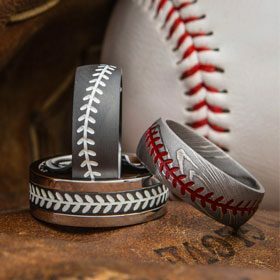 You'll get your choice of mixed media, including 18-karat gold, black zirconium, cobalt chrome, or titanium, allowing you to find a ring that perfectly suits your style. If you're looking for an understated meteorite engagement ring, you'll love our stylish Hammered Cobalt Gibeon Meteorite Men's Wedding Band. If you like things a bit out-of-the-box (or out of the atmosphere, in this case), then you'll appreciate the dark beauty of our Black Zirconium Gibeon Meteorite Ring. 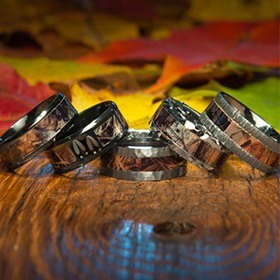 We also have one-of-a-kind meteorite engagement rings for any lady who dreams of a style beyond the diamond. Choose from classic-yet-individualized engagement rings with meteorite center stones, or opt for a glittering diamond engagement ring featuring a swoon-worthy Gibeon meteorite inlay set within a sleek titanium band. For intergalactic romances, there's no better choice than a meteorite engagement ring. How Rare Is the Material in Our Gibeon Men's Meteorite Rings? So, how valuable will the men's and women's meteorite rings become? The debris field marking where pieces of the Gibeon eventually landed is about 70 miles wide and a full 230 miles long, making it the largest known debris field of its kind. Over 25 tons of the meteorite have been found in Namibia since its discovery in the 1830s. Thanks to advances in detection equipment, many more pieces may be recovered in the coming years. Many Gibeon meteorite pieces are available today and are a favorite material of our designers because of their unique Widmanstatten lines and remarkable chemical stability. However, the government of Namibia now prohibits the export of meteorite fragments. As these rings and other meteorite jewelry grow in popularity, they may become increasingly prized and rare. Want to learn more about our meteorite rings or to chat about other rare and exotic rings? Give us a call at 1-866-215-1861 or simply send us an email. We're looking forward to hearing from you. Don't forget to explore more of the best alternative metals and inlays in our full collection of cobalt chrome rings. They may not be out of this world, but they're still unlike anything you've encountered before.